Pixel Qi, a display start-up that’s generating buzz with a laptop screen that works well under indoor and outdoor lighting, showed off prototype touchpanel versions of the new display on Tuesday. Pixel Qi’s screen technology combines a bright backlight for good indoor readability with a reflective layer that makes it easy to read in bright sunlight. That combination has many laptop and tablet PC vendors evaluating the screens for use in their products. With the launch success of Apple's iPad, touchscreens are becoming a hot item but the addition of a touch-sensitive layer to a screen typically means a drop in readability for reflective screens. Pixel Qi developed the prototype screens to show it’s possible to combine a touch-sensitive layer with its display technology and not see those problems. The screens were on show at Computex, the Taiwanese IT trade show that Pixel Qi used to launch its display last year. Several companies were showing Pixel Qi screens in computers on the show floor, but none announced firm commercialization plans. Shenzhen Chuangzhicheng Technology, a Chinese company that makes laptops for computer brand names, said it’s considering using the screens in laptops and tablet PCs to improve readability outdoors. 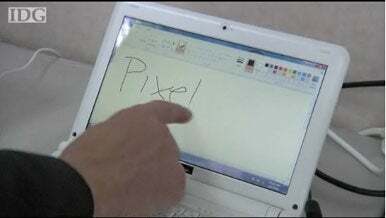 The Pixel Qi screens are based on display technology developed by Mary Lou Jepsen, formerly the head of Intel’s display division and chief technology officer at One Laptop Per Child (OLPC). The screens have been drawing praise and interest ever since their debut last year and the company has been mass-producing the displays since the beginning of this year. It’s now looking at screens in other sizes.